Aelius Galenus or Claudius Galenus (/ɡəˈliːnəs/; Greek: Κλαύδιος Γαληνός; AD 129 – c. 200/c. 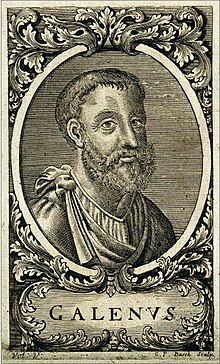 216), better kent as Galen o Pergamon (/ˈɡeɪlən/), wis a prominent Greek pheesician, surgeon an filosofer in the Roman empire. ↑ Nutton Vivian (1973). "The Chronology of Galen's Early Career". Classical Quarterly. 23 (1): 158–171. doi:10.1017/S0009838800036600. PMID 11624046.